Goal: To stabilize and characterize new forms of carbon through tailored synthetic processes for the development of new structural materials. 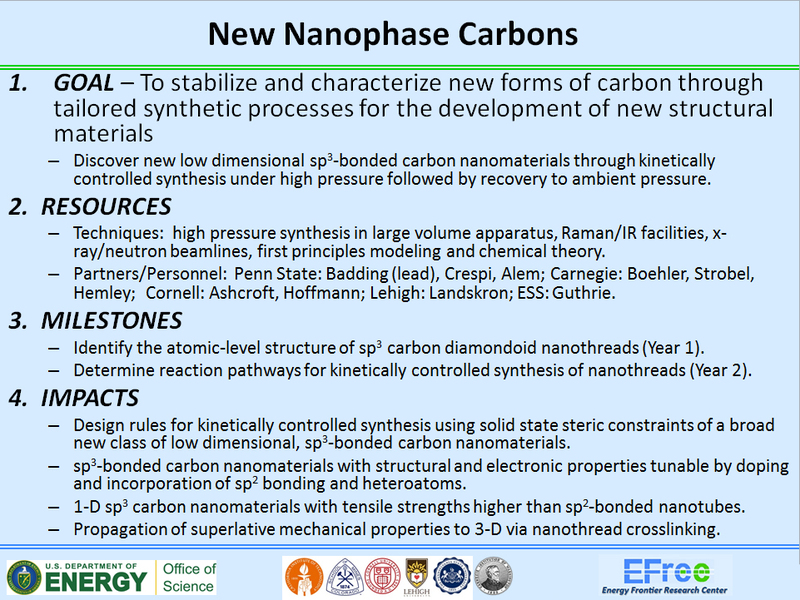 Overview: We are exploiting the successful synthesis from the first phase of EFree of previously only theoretically predicted ordered, one-dimensional sp3 carbon nanothreads to develop a new class of nanoscale carbon with unique promise for structural applications across a diverse range of energy applications. These systems are wider than polymers but narrower than nanowires. Conventional sp2 carbon nanomaterials face major challenges in transferring their extreme nanoscale strength to bulk composites that exceed the performance of existing options.They propagate sp3 bonding over long distances in ordered arrays of one-dimensional threads, capped by hydrogen. Among other opportunities, we are exploiting their intrinsic 3-D bonding to form covalent cross-linkages that propagate their exceptional mechanical properties into the bulk, leading to transformative new materials. We now have the opportunity to potentially develop whole new families of low dimensional carbon nanomaterials. For example, kinetically controlled synthesis starting from aromatic molecules containing heteroatoms (e.g., pyridine) or substituents (e.g., halobenzene) will tune electronic properties and introduce new reactive sites for further chemical modification. These materials are simply not accessible with traditional synthetic capabilities (e.g., conventional high-temperature gas phase synthesis methods). These limitations are overcome by using the new cold compression approach. 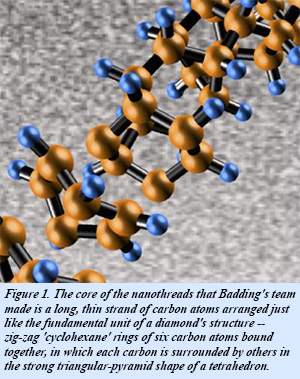 Key milestones are to identify the atomic level structure of nanothreads and determine the chemical reaction pathway for the formation of nanothreads under pressure using in-situ advanced x-ray and neutron characterization techniques, first principles modeling, and chemical theory. We also plan to increase quantities of nanothreads that can be synthesized by developing new large-volume high-pressure apparatus and also use dopant and photocatalytic means to reduce reaction pressures (guided by first principles computation). 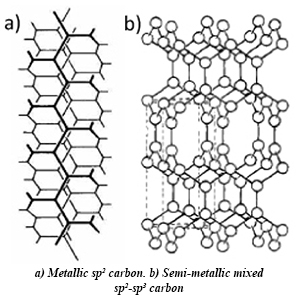 Ultimately, we seek design rules for kinetically controlled synthesis using solid state steric constraints for a broad new class of low dimensional carbon materials, especially those that have low dimensionality and sp3 or mixed sp2/sp3 bonding. These materials may have not only exceptional mechanical properties, but electronic properties useful for energy applications such as tunable band gaps.